You make an excellent point about the schedules being realistic, and it's something that I raised to the planners during our meeting. What's funny is in some cases, there's too much run time, in the case some of the QM lines where buses run hot and can mean long waits as a result which deters ridership. And the thing is Byford stated on TV that he does not believe in adding run time just because buses get stuck in traffic. The implication was that we need more exclusive bus lanes and other measures so that buses can move faster. But those things do not happen over night and in the mean time the only thing that makes sense is for the schedules to be more realistic. The MTA opposes this because on paper it appear that it costs more to run the existing service. The MTA has to pay less attention to what looks good on paper and more attention to what us going on in the real world. The subject I forgot to mention in the articles is how much of the ridership decline is actually due to not adequately counting all the fare beaters. Well I told them that they have got to start addressing the elephant in the room, which is congestion. Thursday's board meeting was one of the most upfront ones I've seen in a while where the agency started talking about particulars like congestion. The will not be able to get back a number of riders even with this new congestion pricing scheme that the has enacted for January to stop people from hopping in cabs. Come January it will cost over $5.00 immediately after sitting in a taxi, not including the actual ride. The people that can afford it will still use it though. I personally will still use Uber Pool or Uber for meetings for sure so charging more will deter some, but the real answer is a cap. The people on the edge may take fewer trips, but the subway has become so incredibly unbearable that I really try avoiding it on weekends. When I visit clients in Brooklyn now from Manhattan, they are literally apologizing and trying to butter me up with food and drinks. lol Thing is they aren't even that deep into Brooklyn. From 42nd street on weekends, it takes me a good hour or more to get over to the Prospect Park area. Ridiculous. The train to Brooklyn is knocked out every single weekend so it's local only and if you try to take an express to the local, the transfers take an eternity. My rant basically shows that if the just ran the express buses on-time and they moved ok, people would use them. Cheaper than cabs and comfortable. With the way that subway is declining, that is precisely why people are switching to the express bus in some cases to avoid the crawling trains and everything else that comes with that. lol... You mentioned the homeless and beggars. They seem to be taking over the subway cars. I don't even ride much during the week, but on weekends, often times both going and coming, someone comes into the car hitting us up for money or playing music or some nonsense. It's almost expected now. Then when you're waiting on the platform, your head had better be on a swivel because you have crazies all over the place or someone begging. I fault the City for this. We have too many mentally unstable people walking around and they need to be treated. Instead de Blasio and his administration turns a blind eye and it's business as usual. Well, this article helped me with a Queens Bus Redesign Project that I've been thinking about. I've basically started and I'm lost. However, a few things that I'm aware of are that Flushing, Jamaica, LIC, Jackson Heights, and Rego Park all have a good set of bus connections, and I'd like to preserve that. Also, since the article mentions that Riders want a DIRECT route, is there a way to record this type of data or no? I like the Q66 extension to Columbus Circle. Really helps give direct service to Manhattan. I would like to suggest to keep the Q46 the same, but make 6 Q46 LTD trips per hour Q46X trips. The route would run weekdays only and operate to the North Shore LIJ Terminal. Service would make LTD stops from LIJ to St Johns University, then non-stop to the subway at Queens Blvd. On weekends, new LTD service would operate to the LIJ Terminal. At all times except overnight, service local service would go to Glen Oaks, while LTD and Q46X service would go to LIJ, with stops consolidated (with walking distance considerations) east of 260th Street. In addition, I also have a Brooklyn Bus Redesign map coming soon (this was delayed multiple times now). The proposals are based off the 2004 map that Allan Rosen (@BrooklynBus) made, with some modifications. Among them are the re-branding of some routes, new ACTUALLY WORKABLE SBS routes, and my own proposed extensions to adapt the proposals to present day Brooklyn needs (to better serve new traffic generators in Brooklyn and Queens such as Canarsie Plaza and Resorts Casino). One of the new SBS routes is his proposed B22 Belt Pkwy Limited route to JFK Airport. In my version, the route has been changed to accommodate a few additional stops along the Pkwy (such as Spring Creek Towers) and a consideration of adding park-and-rides at key locations such as at Kings Plaza and possibly at Gateway Mall, which are both transit hubs. The route will now be called the B34 and will an all new SBS route using specialized buses with luggage racks and BRT Features (bus fleet for this is the New Flyer XD60 and the route will be based out of East New York That is one of the proposed modifications. The rest will be on the map when it comes out. Would just cutting back the Q60 entirely to QBP and having the Q32 be the sole Queens-Midtown route (with some added service) be a good idea? Not really, no. If you were to cut back the Q60 to QBP, it would be MORE congested than it is now. If you were to cut back the Q60, at least end it somewhere in LIC. As for the Q32 being the sole Queens-Midtown bus. I'm not too keen on that. At least with the Q66 extension to Columbus circle, you'd have some type of backup for the whenever they get delayed. (The congestion in Midtown sounds like a challenge of it's own and that sounds like something that and DOT should focus on resolving before getting to Queens for a bus network redesign) Besides. Bus service should be designed to attract Ridership. And (hopefully) get people off Uber/Lyft/etc. At the bare minimum, if there's anything to kick out of Manhattan, it's the Q101. It's much less utilized when compared to the Q32/Q60, and the serves as an alternative for most of its route. It should be cut back to Queensboro Plaza. Ok, what else do you suggest? Alright, but Queensboro Plaza is congested 24/7, the Q101 would need to turn around at 21st Street to then start another run. An alternative solution should be considered but I'll put more thought into that later. Yeah I agree, I don’t know why the Q101 goes into Manhattan as it seems very redundant at this point. From the times I’ve fanned the Q60 and Q101 from Manhattan, the Q60 always gets the higher usage compared to the Q101. The latter usually picks up those that are going to QBP but either missed the Q60 or the Q60 has a gap in it’s service. I do think while MTA Bus has come a long ways from the times of the PBL, I still believe that there are many changes that should have been made by now. It’s like they are too lazy to look into making some obvious improvements. I’m hoping these upcoming bus redesign projects are taken more seriously than the Staten Island Express bus redesign was. Just to name a few of some obvious changes that could have been made are; the elimination of the Q101 in Manhattan, rerouting the Q112 in Jamaica so it’s not backtracking east to then go west via Liberty Ave, eliminating the Q34 completely and fixing up the Q25 service with most old Q34 trips being “new Jamaica-Flushing Q25 short turns, more frequently weekday and weekend Q19 service and so on. The Q60 gets good ridership from 2nd Avenue. I've been on evening buses that have been SRO from there (and the bus wasn't late). Perhaps ending some buses during the midday hours on the Queens side could work, but not entirely. If anything, a split should be done on that route. I would sughest more terminating the Q60 at Archer every day. That way, you can boost service on the Q6 (and perhaps provide all day LTD service that way). I rode the Q60 from QBP home almost every weekday from 2006-2012, and since then, whenever I'm on the upper east side, it has been my go-to way home from the Upper East side. Not once have I seen a line less than 15 people waiting to board that bus in the rush. And oftentimes there are old folks and wheelchair-bound passengers. The Q60 carries quite a bit leaving Manhattan. Heck even when I board it at 28 Street in Queens Plaza, it's often SRO, and the next bus isn't too far ahead (Granted traffic between jackson avenue and van dam street has held it up some, but point is, there's not too much of a distance). Another benefit to the Q60 is that it's most convenient for s/b M15 bus riders... If you're riding the M15 SBS, that'll drop you off at practically 56 Street so you have to walk back up to 59 Street to get a Q32... Which may be pulling out of the stop as you're walking up 1 Avenue, sitting in the FUBAR'd gridlock that is 59 Street, or somewhere down near Penn Station. For the Q60, there's almost always a bus waiting there, either laying over or letting passengers on early. And for the M15 local buses (And M15 LTD... Back when it existed and stopped at 60 Street...), the Q60 is right across the street. That said, short-turning some buses in Queens is logical... but they already do that. Some seem to be scheduled short turns @ 33 Street and others seem to be done at the whim of the dispatcher. And FWIW sometimes they'll short turn Q32s at Queensboro Plaza. I think a Q60 short turn code for 48 Street used to exist, but I don't know if it they use it anymore. I've never seen it in the past 10 years at least. As for the Q101, I concur with all the people saying it should only enter Manhattan in the rush. I've never really understood why it goes to Manhattan anymore. Ever since they took away its unique terminal under the QB Bridge exit ramp or over by 60/61 Street on 2 Avenue, it's become even more irrelevant... Now it just lays over behind all the Q60s has a measly line of 5-7 people at best, literally as an afterthought lol. Furthermore the routing of the Q101 is horrible in the first place because it keeps getting bogged down in horrible Northern Boulevard traffic just outside of Queensboro Plaza so from that standpoint I don't know why anyone would bother riding such a route when the R parallels it to Broadway, where people could transfer to the Q101 to heads to all points north (Not like there's no Steinway traffic north of Broadway....). Perhaps I'm more biased since I've never used the Q101 over the Bridge but save for the handful of people who use it in the rush hour, it's pretty pointless (And that reflects in all the empty Q101 buses I see going over the bridge. The Q101 should stop serving Manhattan altogether. I would suggest extending buses down to the Ferry (either that or the Q102), via Jackson Ave, 46 Ave/46 Road, and Center Boulevard, in order to improve connections and increase ridership on the route. It was probably utilized more from Manhattan when the route operated from to/from Rikers Island. Not really, no. If you were to cut back the Q60 to QBP, it would be MORE congested than it is now. If you were to cut back the Q60, at least end it somewhere in LIC. As for the Q32 being the sole Queens-Midtown bus. I'm not too keen on that. At least with the Q66 extension to Columbus circle, you'd have some type of backup for the whenever they get delayed. (The congestion in Midtown sounds like a challenge of it's own and that sounds like something that and DOT should focus on resolving before getting to Queens for a bus network redesign) Besides. Bus service should be designed to attract Ridership. ﻿And (hopefully) get people off Uber/Lyft/etc. What do I suggest as far as..... What? Is that that chick that want a cracker? In terms of how bus routes should be throughout Queens so that they can reverse the decline in Ridership and provide more frequent service in Queens. 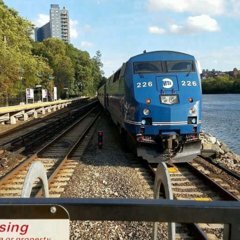 I made a somewhat similar proposal to have the Q103 connect directly with the LIRR and The Ferry in Long Island City. It would have to be extended down to Borden Avenue making a right turn, then loop on 2nd Street and Center Blvd, which would be good, considering the growth of that area. New Apartment buildings getting ready to be built, Amazon Headquarters on Vernon and 44th, Queens Library and the multiple events that happen on the Park Next to Center Boulevard. Sending the Q101 there as well could help gentrify the area. and better connect Long Island City. Is it okay if I add this on to my Queens Bus Redesign Map? Other people touched on this already, but forcing the Q32 to be the only route for multiple different nodes (Penn Station, 32nd Street, Queens<>Manhattan) isn't a good idea. I mean they've already started running Q32 trippers that don't even touch Queens (they drop out at Madison and 57th), which just shows how stupid the M4 move was. I'll leave the route ideas for the individual borough idea threads.... Generally speaking however, much of Queens' bus network (moreso than any of the other boroughs) is antiquated, and for lack of a better word, lacking... That has to be addressed, right along with the PBL-level service levels &/or scheduling some of these routes still have. Are these additional Q32 trips or Q32 trips that'd normally run to Jackson Hgts?